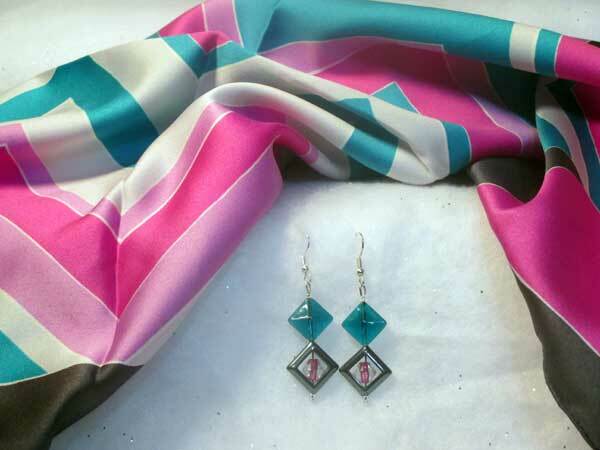 This geometric designed scarf has a funky color combination of charcoal grey, light grey, teal, lilac and fuschia. With what do you pair a funky scarf? Funky, geometric earrings, of course! Diamond shapes are used in the teal dimensional beads and the open hemalyke beads with glass bicones in the center. A touch of fuschia in the center beads make this set a beautiful combination. The earrings hang over 1.5" from the finding loop. This scarf is the same as in item #94 with a different style earring.